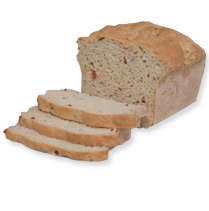 Our bread is preservative free and should be consumed within 5 days of purchase. In warm weather, store your bread in the refrigerator. In cooler weather, bread may be stored in a cool place or in the refrigerator. If you do not intend to consume your bread within 5 days, place a portion of your bread, well wrapped, in the freezer for future use. Bread may be frozen for up to 3 months. Gluten free bread loses moisture and flexibility as quickly as 2 days after baking. If bread loses flexibility, simply place a slice or slices of bread in the microwave for 25 seconds (or longer depending on bread type and amount) to prevent crumbling and to restore moisture and flexibility to its original state. Use as intended for sandwiches, French toast, toasting, etc. Gluten free bread is best when sliced as needed. Pre-slicing bread may accellerate the moisture loss. If pre-slicing prior to freezing, wrap individual slices of bread in plastic wrap, then place in a freezer bag to maintain the best quality. There is an additional charge of $.50 per loaf to have it hand-sliced. We invite you to call Dee's One Smart Cookie llc with any questions (860) 633-8000. I've even gotten vegan cakes here and they are so good you'd never know they were vegan. My favorite treat is probably the vegan raspberry breakfast bar. It's delicious! The woopie pies are great too.